Handhold size make it portable for outside use! A suitable child projector —— YG300 ！. Support aspect ratio between both 16:9 and 4:3. Physical Resolution: 320 240, support 1080P. Multi-selection interface:HDMI USB AV input SD. Trending at $42.99eBay determines this price through a machine learned model of the product's sale prices within the last 90 days. Product Specifications:Imaging unit:LCDNative resolution:320x240 pixelsSupport resolution:1920*1080PBrightness:600 LumensColor:16770KContrast:800:1Projection size:24-60 inchesAspect ratio:4:3 or 16:9Projection distance:1-3.8MProjction ratio:2.7:1Total power:24W(12V, 2A)Product size:126.4x85.8x47.7mmSupported Types:Supported language: English, etcInput Interface:AV, USB, SD card, HDMIOutput Interface:Lound speaker, Stereo headphoneAudio file:Support MP3, WMA, AAC audio files ,etc.Seven kinds of sound effects SRSImage file support: Common format like Jpeg, BMP, PNG, etcSupport image scaling:360 spin, be able to browse image in full screenVideo file:Support format like MP4, RMVB, AVI, RM, MKV, etcText reading:Support TXT format and auto flipNote:1. Please use. This Mini LED Projector is convenient to carry with a lightweight and portable design. With 3 pieces glass. the projector can show a clear image for you. Speakers built-in projector, no need connect with any extra speakers. Multi-selection interface:HDMI USB AV input SD. Handhold size make it portable for outside use! A suitable child projector —— YG300 ！. Support aspect ratio between both 16:9 and 4:3. Physical Resolution: 320 240, support 1080P. The smart phone projector makes a fun DIY project. 1 DIY 3D projector cardboard. Silicone grip pad to hold smart phone. Material: paper. To reverse a screen on smart phone, just download an app. ❤Upgrade & New Design - IOS output( Fluent, Non-Caton) / DLP light(More clear and vivid) / OFF-SET(off-axis function). Professionally designed projection imaging reflection principle to protect children's eyes. Projection model: Front/Rear projection. - USB TF card Format. (Ideal distance is 3.5M with 120" display.). - LONG LAMP LIFE - Our Video Projector allows the lamp to shine bright for up to 20,000 hours. 【Mini, Compact & Lightweight】The weight of the Artlii mini LED Projector is only 0.28kg, very light. It's size is 12.5x8.6x4.7 cm, very small. This projector can connect with iphone(not include Version 4 and below)ipad and all windows devices, but can not connect with Macbook. Support iOS Cast and Miracast, wirelessly screen mirroring your iPhone, iPad, smartphone and tablet to a huge projection. After WiFi connection, you can directly streaming HD videos, audio, images, office files from your smartphones, no need to use cables and buy HDMI adapters, wireless dongles, very convenient to use. The LED lamp provides up to 20,000 hours of low maintenance life(By contrast the bulb life of non-LED projectors is only 5,000 to 8,000 hours.). The projector supports red and blue 3D format, as well as a 800:1 contrast ratio and 800 480 native resolutions. Features: Adopt for Android style Independent and streamlined UI design. Support rich Expansion complete - link U disk mobile hard disk PC laptop HD Blu-ray DVD LED light source, does not blink, not tired eyes LED liquid crystal display technology, the color is more realistic, the picture is clearer Double copper tube cooling technology, faster heat dissipation, more stable operation The body design is small and beautiful. It is convenient&nbs. Compared with wireless Miracast devices/accessories, the RAGU Z480 is equipped with wired Miracast technology, which ensures the consistent stability and reliability without any connection issues. 1X RAGU Z480 Projector. Smartphone Projector for iPhone Android Tablet, RAGU Z480 Mini Portable Video Projectors via Wired USB Data Cable Support HD 1080P, Max 130" Screen Optical USB/AV/SD/HDMI/VGA Interface LED Projector. More Relax and Romantic. Clearer and Brighter Picture Quality: 800 x 480 native resolution, max support 1080p. Physical resolution: 800 480, support 720p, 1080P. 1x Mini WIFI Video Projector. Support: Android ,IOS,PC, MAS. ❤HIGH-QUALITY RESOLUTION - Using DLP technology to achieve large-screen projection. Native 854 480 Pixels, Support up to 1080p decoding (Contrast: 3500:1). Supports for iPhone 8 / 7 / 6 / 6s plus. ❤KINDLY NOTE - An original Apple HDMI cable is needed to connect the projector and your iphone. Multi-selection interface:HDMI USB AV input SD. Handhold size make it portable for outside use! A suitable child projector —— YG300 ！. Support aspect ratio between both 16:9 and 4:3. Input: HDMI USB AV input SD. Multi-selection interface:HDMI USB AV input SD. Handhold size make it portable for outside use! A suitable child projector —— YG300 ！. both 16:9 and 4:3. Physical Resolution: 320 240, support 1080P. Condition: New in open box. iPhone/iOS version only. FEATURES: Pico projector with both off-axis effect and Keystone Correction. 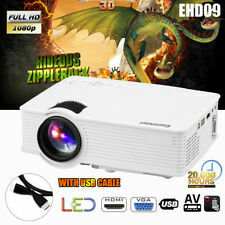 We choose to highlight H3S DLP,brighter, richer color, higher contrast(2000:1),mini dlp projector support 1080p. The weight of the Artlii mini LED Projector is only 0.28kg, very light. It's size is 12.5x8.6x4.7 cm, very small. 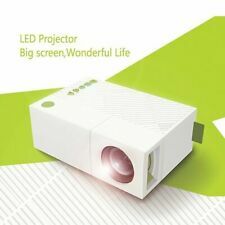 So do not worry.Choose this mini smartphone projector to enjoy. Compared with wireless Miracast devices/accessories, the RAGU Z480 is equipped with wired Miracast technology, which ensures the consistent stability and reliability without any connection issues. RAGU Z480 Mini Projector ensures the consistent stability and reliability with its ready-to-go compact size. Projector technology: DLP 0.3" EM DMD. It supports Airplay, Miracast and DLNA technology and allows you to project the screen of your iPhone, android phone, iPad and other devices. OS: Android 7.1. Color:White Projector W/ Mini Tripod. ❤Upgrade & New Design -IOS output( Fluent, Non-Caton) / DLP light(More clear and vivid) / OFF-SET(off-axis function). Professionally designed projection imaging reflection principle to protect children's eyes. 1 x Projector. Lightweight Design: 4.7 3.4 1.9in mini Size and weight just 595g also with Pretty cute appearance make it very compact and portable. It is a good assistant for children education and Art Work Projection, and also an attractive children toys. DLP and OFF SET. The use of advanced DLP technology to ensure that the projection color saturation, natural and realistic！Protect your eyes ！. ❤Upgrade & New Design - IOS output( Fluent, Non-Caton) / DLP light(More clear and vivid) / OFF-SET(off-axis function). 1Piece U20 mini projector. - Projection Technology: 2" LCD Display Technology. - The best projection distance: 0.6-4m. 1Piece AV cable. - Projector light: LED light (more than 20,000 hours). - Projector ratio: 16:9/4:3. Projection distance: 0.8-2m. - Projection ratio: 4:3. - Input interface: USB/TF/HDMI/AV. 1 piece 3in1 AV Signal Cable. - Long Lamp Life - Our Video Projector allows the lamp to shine bright for up to 30,000 hours. ③:Choose the Mirroring. Then the multi-screen interaction with projector and iPhone is successful. Projector Screen. Projector Accessories. Portable16:9 Projector Screen 60"/72"/84"/100". 2018 Latest Design, EUG LCD LED mini projector 600D (W). Projection model: Front/Rear projection. - USB TF card Format. - VGA INPUT: (800 X600Q60Hz: (480i 480p 576i 720p 1080i 1080p). (Ideal distance is 3.5M with 120" display.). - LONG LAMP LIFE - Our Video Projector allows the lamp to shine bright for up to 20,000 hours. ). Projection scale: 16:9/4:3. - Input interface: USB/DC5V/HDMI/AV. - Long Lamp Life - Our Video Projector allows the lamp to shine bright for up to 20,000 hours. 1 piece Video Projector. 1 piece Micro USB Cable.